Prepaid Phone News spotted a dealer post at Howardforums that H2O's double the data promotion will continue to run until the end of June. By the time the promotion runs out, it will have run for 7 straight months. 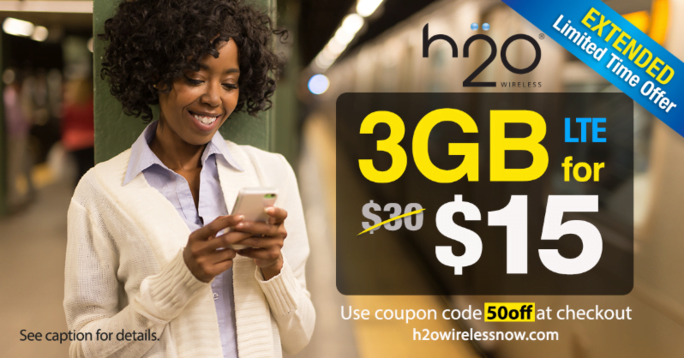 It is expected that this will be the last time H2O Wireless extends the promotion. The AT&T MVNO has said that it hopes to release revised and permanent plans by the time the promotion ends. It is beginning to seem as if H2O Wireless is running a perpetual promotion. Today, H2O Wireless announced that its double the data promotion, which the company has been running since December, will continue to run through the end of May. Additionally, AT&T MVNO H2O Wireless is offering 50% off of its monthly unlimited plans with code "50off" for the first month of service. Additionally, free shipping with a free SIM card are also part of the promotion. The offer can be combined with the companies previously announced bonus data promotion that features 8 GB of data for just $36 making this one heck of a promotion, and currently the best value that you can get from an AT&T based network provider. All plans include unlimited talk, text, international talk, and international text as well as throttled 2G data once the plans high speed data is used up. The 50% off promotion is only for new activations and transfers. It is an extension of a previous offer that expired back in December. H2O Wireless has not said when the new offer will expire, and their webpage hasn't been updated with this information either. If you've already missed the promotion, independent H2O Wireless dealers through Amazon.com regularly offer very similar deals. To find out more, visit H2O Wireless's Facebook page or check out my review of H2O Wireless after I took the MVNO for a 30 day test spin. Just an fyi, int’l sms still sits at 100 outgoing and unlimited incoming per their FAQ page. I might consider porting over to them from AV. Still no word on when this promo expires? Do monthly plan prices revert back after the first month?